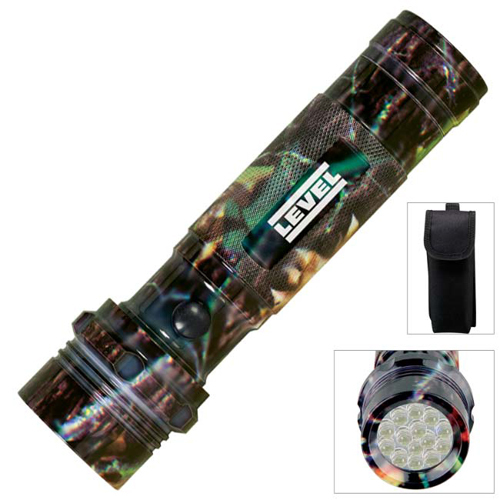 Camouflage Aluminum LED Flashlight, batteries included.Authentic Mossy Oak® camouflage pattern makes this the perfect flashlight for your next trip to the woods. 100,000 hours life cycle rating. 14 ultra-bright white LEDs. 5-3/4" W x 1-5/8" Dia. Gift Boxed / 26 lbs / 50 pcs. Price includes one Laser Engraved imprint in one location. A set-up charge is additional at $55.00. Optional Pouch available at $0.70 each.